Last week's snowfall was the biggest February snowfall in the recorded history of Chicago. That's a lot of snow and it came on the back end of a tough stretch of sub-freezing days. But many hard-core riders don't let the conditions keep from from hitting the streets. 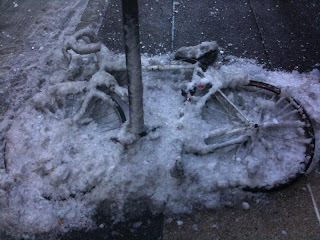 It is perfectly legal and appropriate to continue to ride in the winter, even if there is snow on the ground. Be seen. It gets dark early in Illinois during the winter. Make sure you have a headlight, tail reflector, and extra reflective tape and lights so that you are seen. See my earlier post on this legal issue here. Make sure you have tires that can grip and brakes that can clamp. If there is a lot of rain/sleet/snow this is even more important. Keep the moving parts on your bike well lubricated. This prevents rust and keeps everything moving so you can ride through the winter and right into spring. 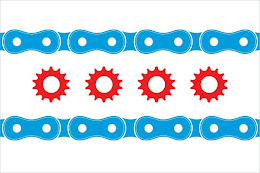 Check out the website for Chicago Bike Winter for tips and events to enjoy biking through the year.